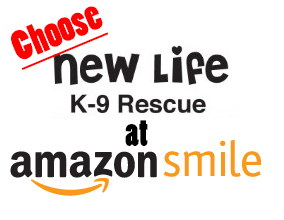 If you shop using amazon smile though New Life K-9 Rescue, a portion of the price is donated to us. Search "New Life K-9 Rescue" in amazon smile and help us save lives! Donate your car, boat, truck, RV, Jet Ski or snowmobile to New Life K-9 Rescue and receive a tax deduction. This no cost, no hassle process begins when you contact our fundraising partner, Donation Line LLC at 877-227-7487. Or you can click below to donate online now. Email Sign Up! Receive updates and info on all the good things at New Life!